Note: This is the second installment of a three-part series exploring Tableau's own culture of self-service analytics. The first piece explored the benefits of data sources. So you want to build a culture of self-service analytics, and you understand the value of data sources. What comes next? Once users begin engaging with their data, they’re bound to have questions. That’s what we saw here at Tableau where every employee gets a copy of Tableau Desktop as well as access to data. As users dove deeper into their analysis, they ran into roadblocks—in dealing with the data and the tool itself. Users got stuck, and without a place to turn to with their questions, they stayed stuck. Our users clearly needed more than data sources; they needed support throughout their journey. To address this gap, we created a one-stop support shop for our internal Tableau users. We call it our enablement platform. Think of this space as a wiki or a forum dedicated to your organization’s Tableau deployment. 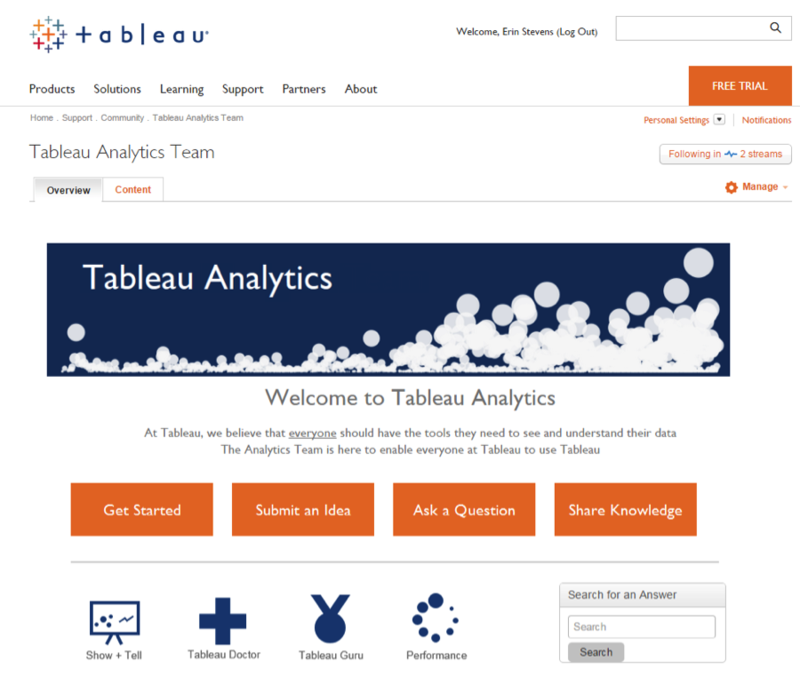 Here at Tableau, anyone can visit the enablement platform to learn more about Tableau as a tool. This is a great place to house guides on getting started with Tableau and accessing data in Tableau Server. These starter documents will enable newcomers and help grow your culture to scale. A key component of the enablement platform is a forum where users can answer each other’s questions and tackle problems as a group. A community space can evolve into a powerful tool for users, as we’ve seen both internally and externally here at Tableau. 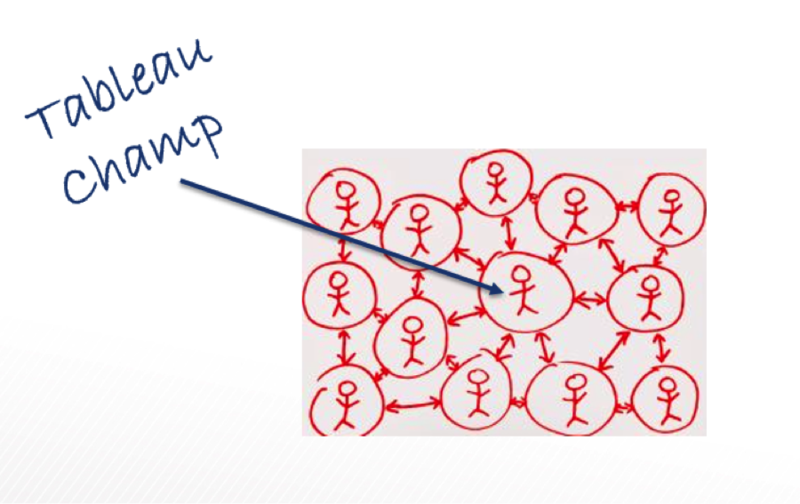 Most Tableau deployments start with a few users, often on the same team. A Tableau champion is established early on, and other Tableau users go to this person for help. As the deployment grows from 10 Tableau users to 100, to 1,000+, it can be difficult for users to connect with one another. This is where the enablement platform proves crucial. It allows numerous users to connect across departments and even time zones. This platform scales automatically with increased usage in your organization. Since every question and answer are documented and searchable, they can help numerous users, not just the one who first posed the question. To establish our enablement platform, we enlisted the help of a small group. We created a community forum on Jive where we posted a few starter guides. And we engaged with the group to spark discussions among the users and with our team of Tableau enthusiasts. The group members helped nurture the space into a group-learning space. They also helped seed starter content across the organization. Based on the group's feedback, we made improvements to the site. Then we rolled it out to the entire company. New employees now receive a link to this enablement platform when they receive their copy of Tableau Desktop. Not only do they have access to helpful resource material, they also get connected to other users who can help them maneuver challenges and move forward. Since we launched the platform in October 2014, nearly half of our entire company has turned to this space for support. Every department is represented among the users, and on an average day, employees utilize the community 50 times. When we first launched, a colleague in our London office quickly became one of our most active participants. Through the forums, he learned about the new data sources available, and advocated to include data relevant to our teams in EMEA. The forums have also helped him get connected with the rest of the company. Now, when we start something new in Seattle, he is quick to follow and establish similar events and programs in London. So how can you start your own enablement platform? For starters, leverage existing systems. If your organization already has a corporate wiki (on Sharepoint, Confluence, or Jive, for instance), create the platform on that existing space. Be sure to incorporate a forum. Give users an easy way to post and respond to questions. And consider establishing a Tableau User Group in your organization, be it virtual or in-person. Foster collaboration and help users take their data exploration to the next level. And don't forget to support users who seek help in other ways. If a user emails a question, answer that question privately then post the solution on the community forum. There isn’t a wrong way for users to ask for help, but there is a right way to gently support each user's needs. Make sure your enablement platform is useful to employees across the entire organization. Here are a few tips based on what we’ve learned. 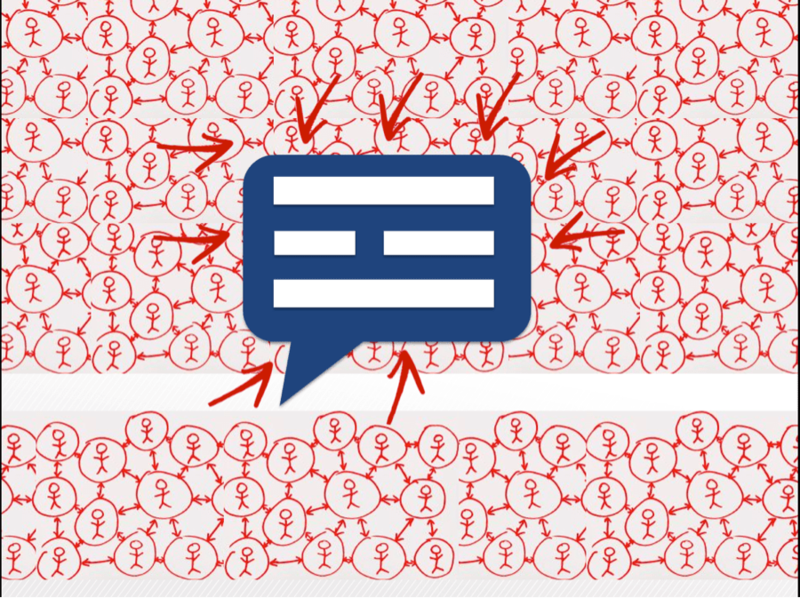 Keep it simple and open: Some of the most valuable sources of information are crowdsourced (think Wikipedia). Encourage others to contribute knowledge, and make it easy for them to do so. Start early: Roll out and iterate. Don't feel like you need to get all the resources into your platform before you share it with others. The platform is a living framework. The more people use it, the more it will grow organically. Enable Q&A: Make sure there is a place for users to ask questions. Instead of having just one person or one distribution list field questions, open up the conversation to the community. That way, your users can leverage the collective brainpower of your entire organization. Share proudly: Announce your new platform in an email, and talk about it all the time! You really can't be too loud. It can take a while to cut through the sea of announcements and information, especially in a large organization. So don’t be shy. Trust me, your users will want to know about this resource. Before we had an enablement platform, many of our users didn’t know where to turn with questions. Now, everyone has a place to go. Our enablement platform helps new users evolve into tomorrow’s Tableau champions, and in doing so, helps grow our culture of self-service analytics. You rock Erin! I look forward to Thursdays and being able to learn from your team and you. Thank you for continuing to empower our teams to find answers to our tough questions. You are greatly appreciated!